As my friend Paolo and I were lying in the straw at Wacken ahead of Edguy's show, a guy crossed our way and thrown us two CDs. I suppose he saw my metalreviews.com logo in the back of my shirt and decide to give me that CD. As he continued his way, he thrown away other Cds all around the place. The cover and the logo are the ugliest thing I have seen in my life and to be totally honest, without the call of my friend Paolo, I would never have reviewed this band : "Hey Danny, do you remember that CD we received just before the Edguy show ? I hope you still have it because this band is wonderful", he said to me. "I really suggest to check them out". I search inside my Wacken CD-tower (in other words I check inside the 50's CDs I bought there) and found the famous CD. Sencirow ? What a strange name ! I hit the play button and the music started. The production could have been much better, but is still good enough to continue. The first spin has been effectively a huge smash. This band reminds me so much Stygma IV - that's actually the vocalist who remind me Stygma IV. The song-writing is top notch and the overall sound likes a crossover of Iron Maiden, Pink Cream 69 and Stygma IV. The approach of the music comes directly from the 80's, but that's not considered as a negative point here. There are absolutely no highlights to be spotted on this CD because all of the songs are excellent. My favorite songs might be the fantastic opener The Hermit and the last killer track Dark Memories, with absolutely amazing Maiden's melodies and a vocal performance by Daniel "Kensington" Seifert (vocal & guitar) that shines above nearly everything I have heard lately from the heavy metal scene. 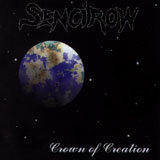 Sencirow are able to write songs with fantastic melody lines and impressive galloping guitar riffs. The tricky sound however doesn't help here and I hope they will find quickly a label for these fantastic nine tracks !!! Actually, if this band doesn't find a label with this album, I am wondering who will ever found a label. You like Wolf, you will fall in love with Sencirow. Of course these musicians need to digest their direct influences (Iron Maiden, Helloween when the tempo gets faster), but Ernst (guitar) and Seifert (vocalist) are for sure great songwriters. The second track Daydream is a pure moment of pleasure guaranteed. I definitely invite you to check their website www.sencirow.de for more info about this German heavy/power metal band and I wish them good luck.